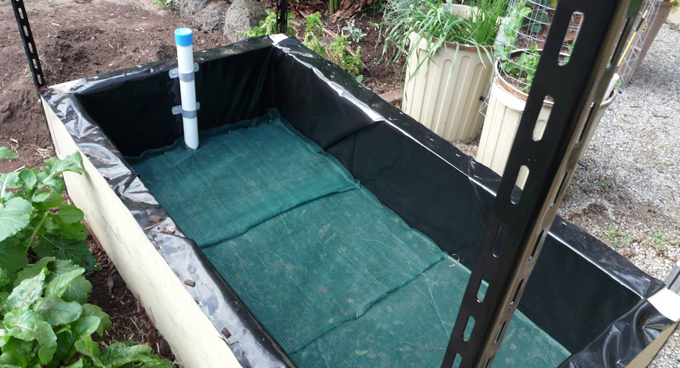 When I built my first wicking worm bed 10 months ago, it was a test bed designed to gain experience with the process. My plan was to eventually convert my vegetable and fruit growing backyard from conventional organic drip line gardening to wicking worm beds. As far as I am concerned the experiment was a success. Soil fertility has improved and vegetables remained pest free without resorting to external inputs of fertilisers and pesticides. Water use is significantly reduced, yet soil condition has been maintained at optimum moisture levels. I have just built my first large wicking worm bed designed to replace one of my 4 conventional beds, but last spring I built 3 new beds of a different design. I wanted to explore a cheaper more versatile option for potential gardeners who have little or no access to a garden of their own. Two years ago I began my retirement with a desire to create a model backyard vegie garden. I wanted it to carry the lightest carbon footprint possible, and conserve precious water supplies. I had started out years earlier by the conventional organic route, with no synthetic chemical fertilizers or pest controls. 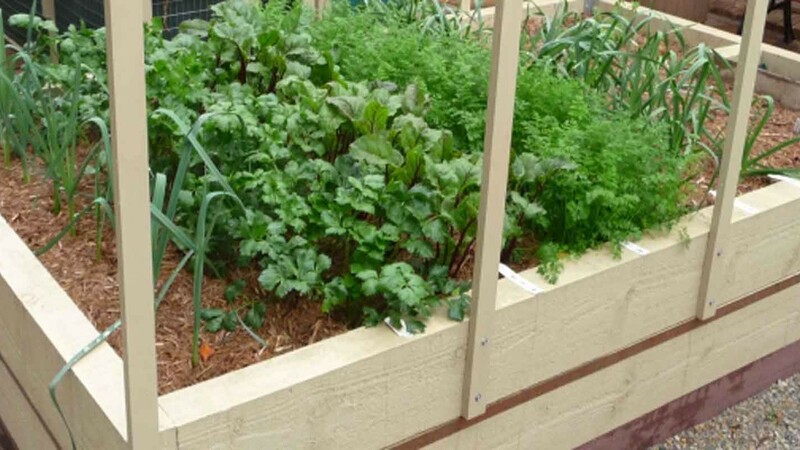 I had installed water tanks and surface drip irrigation, and I had composted large amounts of material in my twin bin arrangement. I began to experiment with cheap 60 litre bins (see above) with great results. The vegies always had enough water, yet used very little. 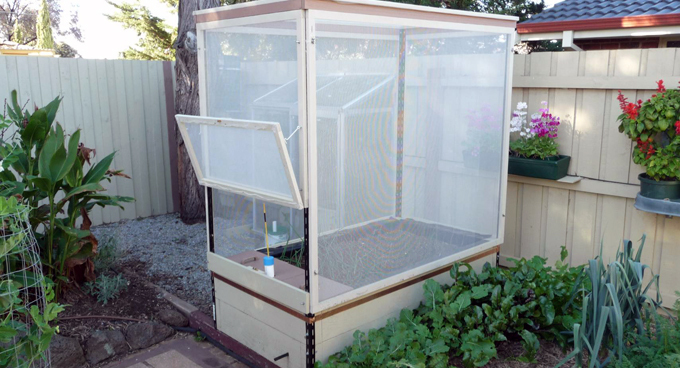 Recently, I built a larger unit with a built-in worm farm, and pest exclusion frame. (see above behind wicking bins). My aim with this unit is to restrict consumption of fertilisers, pesticides and water to a minimum. (even organic fertilisers and pesticides). 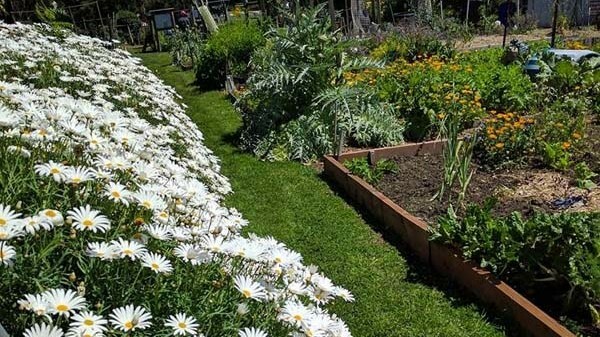 The theory is that by incorporating a worm farm into the wicking bed, the whole bed becomes part of the worm habitat, and the soil is fertilised and aerated by worm activity. Microbial activity is enhanced by the breakdown of Pine bark in the water reservoir. Fertility in the reservoir is also boosted by the direct leaching of worm wee from above. I am uncertain at this stage what will happen to all the worm poo. At this stage (2 months worm activity), I seem to keep adding new waste to the farm all the time and I assume it is being distributed as poo throughout the bed. If it builds up too much in the worm farm, I may need to empty one side periodically and apply the worm poo (and accompanying worms) as a top dressing in the open bed. The worms will find their way home. 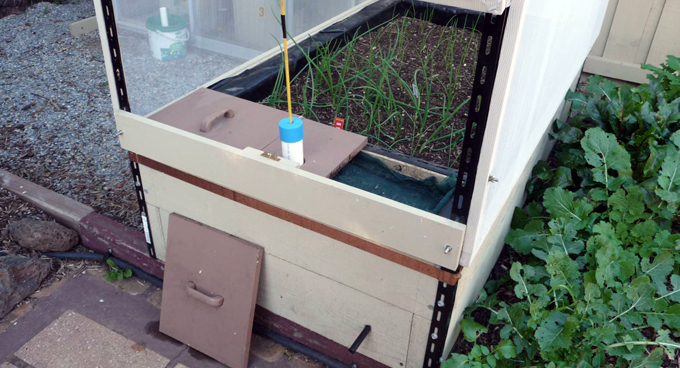 If all goes well, the only additions to the system, apart from water, will be vegetable waste from garden and kitchen. The bed is partly buried in the ground, and the timber walls of the bed are lined with pond liner to enable a water reservoir to be created in the bottom 300mm of the bed. Below the shade mesh shown in the photo above is a 300mm layer of aged Pine Bark Chips. The shade mesh acts as a barrier stopping the soil from mixing with the Pine bark but allowing water to wick up out of the reservoir into the soil. Right at the bottom of the reservoir is a double loop (shaped like an 8) of 50mm slotted irrigation pipe joined by a moulded PVC “T”. A vertical piece of 50mm PVC tube is attached to the “T” and extends above the timber walls (as shown above). This arrangement allows the reservoir to be filled from the top without soaking the soil and plants. Just inboard of the filler pipe is a fibro cement divider set so that there is a 70mm gap between it and the shade mesh barrier. This divider separates the soil in the open bed from the decomposing waste in the worm farm. The above photo shows the bed partially filled with good soil to a height of 70mm above the shade cloth barrier. This layer of soil extends under the fibro cement divider and into the worm farm allowing the worms access to the open garden bed. The open bed is then filled to the top with more soil. 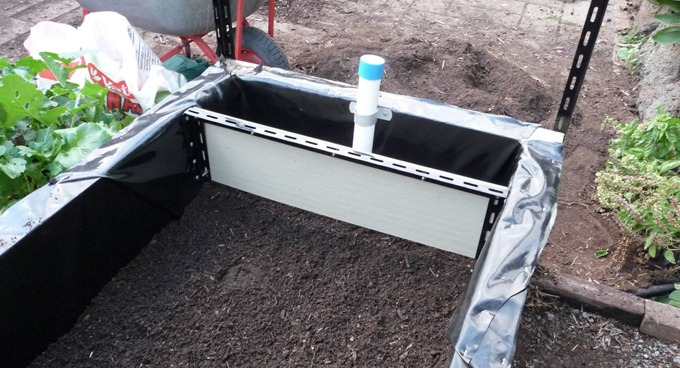 A 3 piece cover protects the worms from sunlight and predators, and provides access to the worm farm. A strip of shade mesh is used to provide further protection for the worms and help contain moisture. The filler tube is capped to prevent access to snails, slugs and mosquitos, and a water level gauge pokes through a hole in the cap. This gauge is simply a table tennis ball glues to a light stick. The stick is painted with the high and low water level marks. Just visible in the bottom middle of the photo, is a 13mm drain hose, which is set just under the shade cloth barrier level. This drain allows you to accurately fill to that level, and prevents overfilling in the event of heavy rain. The metal angle corners serve to hold the timber walls together, and support a set of removable frames covered with insect exclusion netting. The netting is rated at 21% shading, and this will provide summer protection against Melbourne’s fierce summer sun. It remains to be seen how successful this prototype backyard wicking worm bed is going to be, but if it works well, I intend to replace my conventional beds with larger versions of it.